Background: The Nazis attempted a transformation of German music by driving out not only Jewish performers and conductors, but also any music written by Jews, or music the Nazis thought inconsistent with their worldview. This is an interesting list dating, it looks, to 1939. The text at the top translates: “Following the regulation to protect musical cultural works of 29 March 1939 (German Legal Reporter #77 of 31 March 1939, Völkischer Beobachter, Full edition Nr. 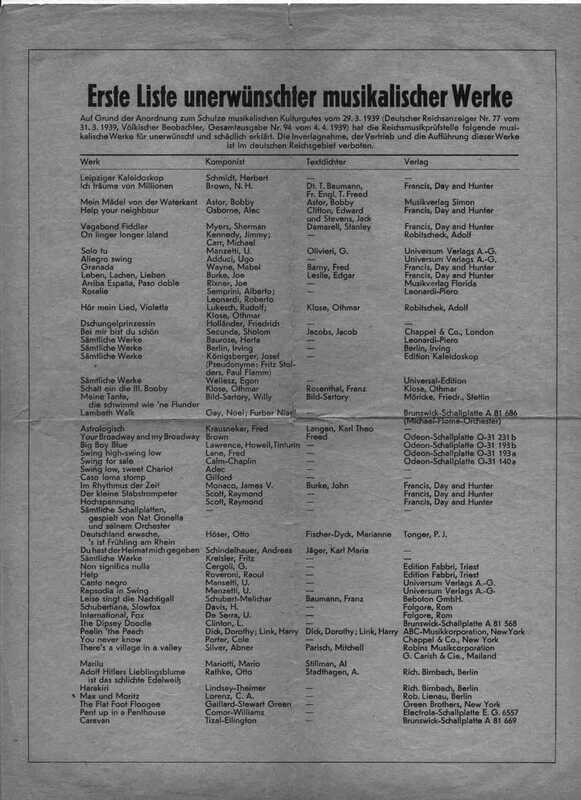 84 of 4 April 1939), the Reich Music Examination Office has declared the following musical works as undesired and harmful. Publishing, distributing or performing these works is forbidden in the German Reich.” Itâ€™s an interesting list. The Source: This comes from a scan of the original provided to me by a friend of the site.